As we are celebrating the appearance day of Srimati Radharani, otherwise known as Radhastami, I was reminded of the transcendental qualities of Srimati Radharani. 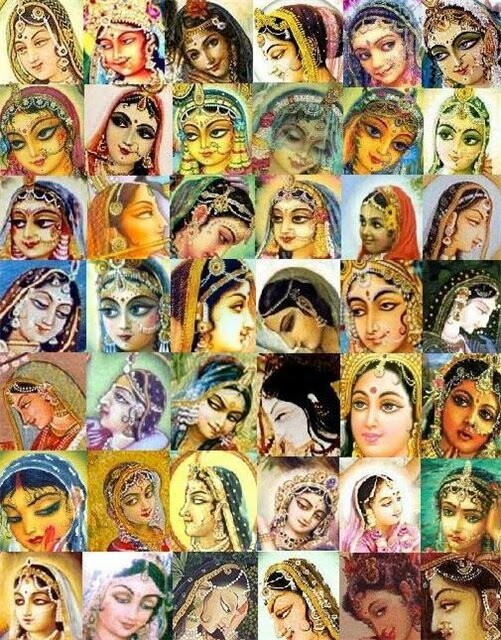 She has twenty-five transcendental qualities, and She can control even Krsna by them. 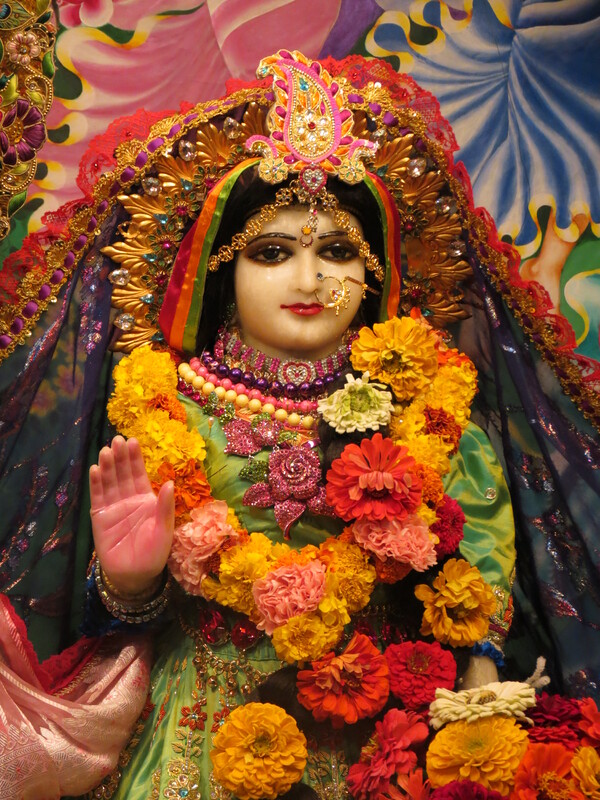 The appearance of Srimati Radharani is coming up on the 26th of this month. With this in mind, we will be posting some nice Radharani Nectar in the next few days. If one always chants the holy name of Kṛṣṇa, gradually one is freed from all reactions of sinful life, provided he chants offenselessly and does not commit more sinful activities on the strength of chanting the Hare Kṛṣṇa mantra. In this way one is purified, and his devotional service causes the arousal of his dormant love of God. 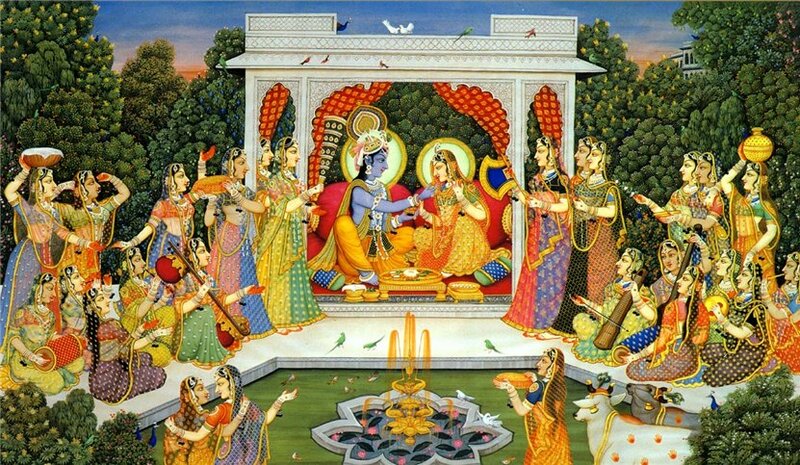 If one simply chants the Hare Kṛṣṇa mantra and does not commit sinful activities and offenses, one’s life is purified, and thus one comes to the fifth stage of perfection, or engagement in the loving service of the Lord (premā pum-artho mahān). Since no one can trace the history of the living entity’s entanglement in material energy, the Lord says that it is beginningless. By beginningless it is meant that conditional life exists prior to the creation; it is simply manifested during and after the creation. Due to forgetfulness of his nature, the living entity, although spirit, suffers all kinds of miseries in material existence. It should be understood that there are also living entities who are not entangled in this material energy but are situated in the spiritual world. They are called liberated souls and are always engaged in Kṛṣṇa consciousness, devotional service. 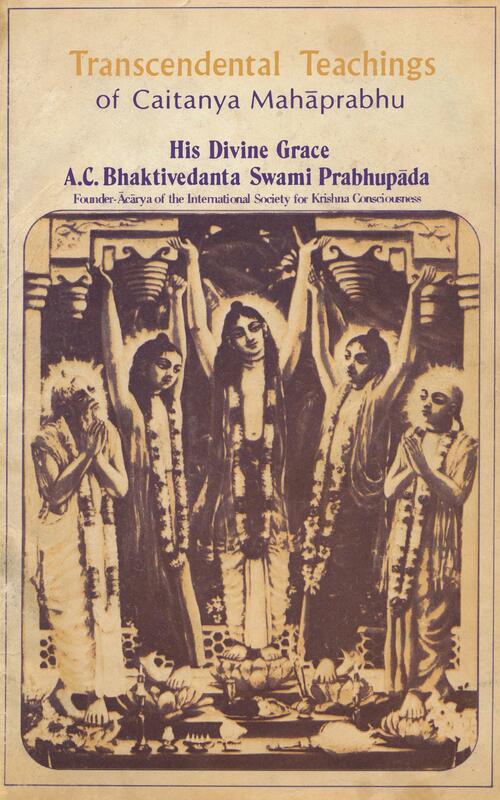 We share with you this nice little booklet printed in 1972 by the ISKCON Press. 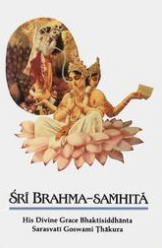 This book is Srila Prabhupada’s “A short sketch of the life and teachings of Lord Caitanya, the preacher of Srimad Bhagavtam”, which appeared in the Introduction to the Srimad Bhagavatam. This scanned copy was made available by Krishnapath.org where you can go to find other ebooks and Audio books that are available as a free download. To veiw or save the entire book follow link below. Hare Krishna! 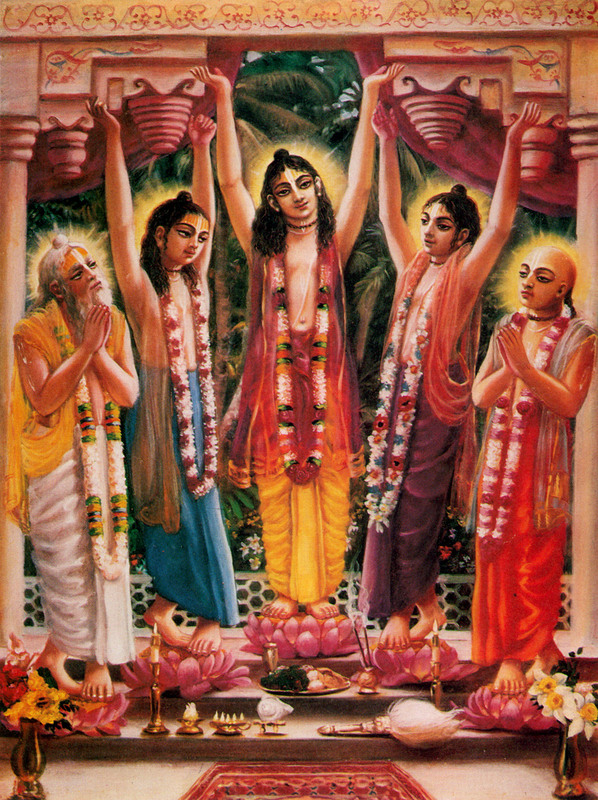 The transcendental teachings of Lord Caitanya Mahaprabhu offer a practical and scientific method by which anyone can easily develop love for the Supreme Personality of Godhead, Krsna. 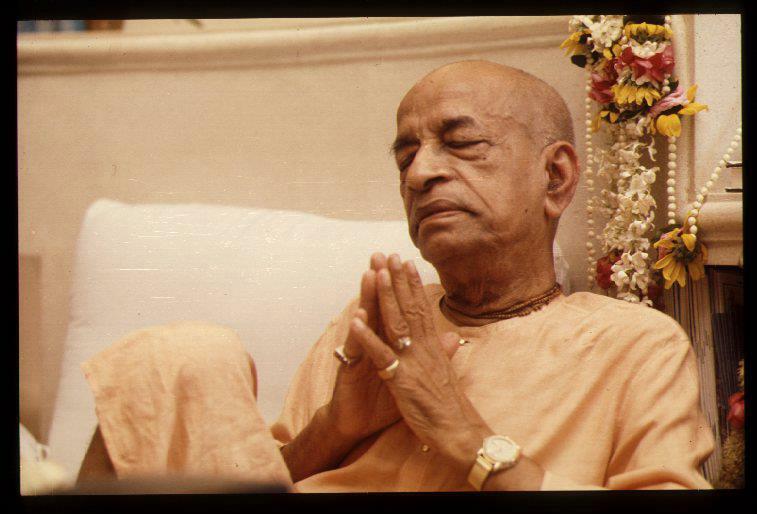 These teachings, in their pure form, have been spread all over the world by His Divine Grace A.C. Bhaktivedanta Swami Prabhupada, to whom devotees of Lord Krsna and Lord Caitanya throughout the world offer their most humble and respectful obeisances. (25) She always keeps Kṛṣṇa under Her control. The instructions and teachings of Lord Caitanya are very important for people in general. He teaches the process of devotional service, which is the constitutional occupation of every living entity, for it is every man’s duty to advance in spiritual science. 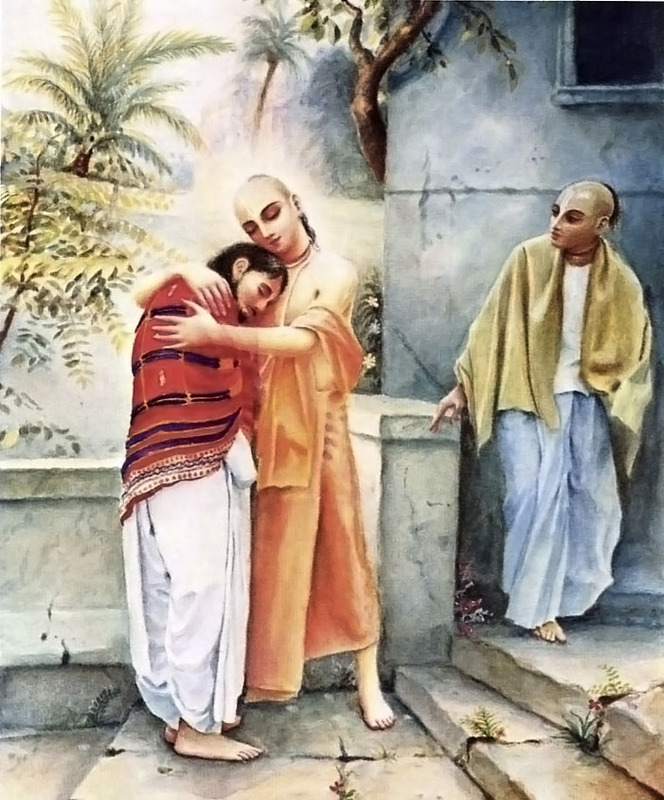 Many subjects were thoroughly discussed in the talks between Lord Caitanya and Sanātana Gosvāmī. Due to the mercy of Lord Caitanya, Sanātana was able to put important questions before Him, and these questions were replied to properly. The Lord proceeded to quote a verse from Śrīmad-Bhāgavatam to the effect that a person who is a devotee of Lord Kṛṣṇa and is one hundred percent engaged in devotional service is far better than a brāhmaṇa who is versed in all the Vedic literatures but who does not engage in the devotional service of the Lord. Because he is carrying the Supreme Lord within his heart, the devotee can purify everyplace and everything. …and the word that kept coming up in my mind was “Ecstasy”. 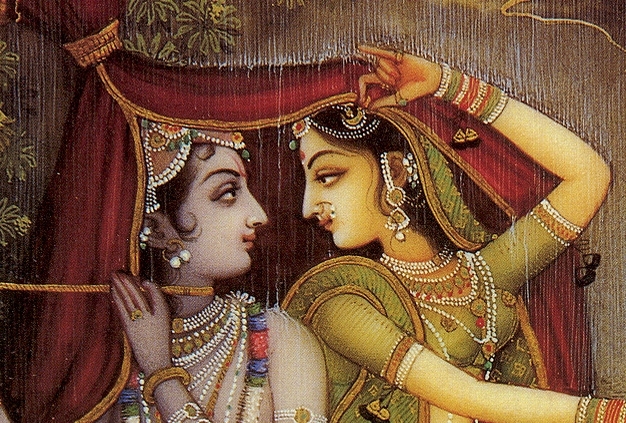 I could not even begin to understand what Srimati Radharani must be feeling when She looks at Krishna, or what Sri Krishna must be experiencing when He looks into the eyes of Srimati Radharani. It must be Ecstaic Love! Sometime back I ran across this picture and saved it to my files thinking I could use it in a post someday. While posting this chapter from the Teachings of Lord Caintanya, entitled “Unlimited Forms of Godhead”, I was looking for an image to use. So I selected the above image and to my surprise when I clicked on it, it moved. I had forgotten how cheesy cool this image was, and why it captured my interest, back when I saved it. So we share it today with our readers, and thank the unknown artist who put this picture to life. …The different forms of Kṛṣṇa are distributed throughout the universe to give pleasure to the devotees. It is not that devotees are born only in India. 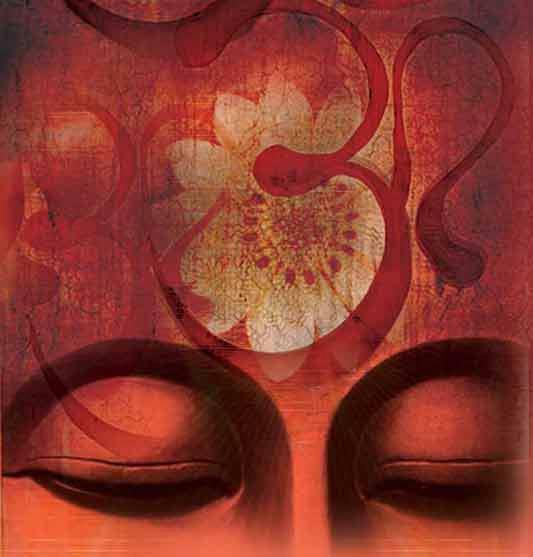 There are devotees in all parts of the world, but they have simply forgotten their identity. These forms incarnate not only to give pleasure to the devotee but to reestablish devotional service and perform other activities which vitally concern the Supreme Personality of Godhead. Here is a new word for your Vaisnava Vocabulary; vaibhava-prakāśa. As I was reading the Krsna Book the other day this word vaibhava-prakāśa just jumped out from the pages, and I was reminded again of the Lord’s omnipotency. “The personal form of Kṛṣṇa can be divided into two: svayam-rūpa and svayam-prakāśa. As far as His svayam-rūpa (or pastime form) is concerned, it is in that form that He remains always in Vṛndāvana with the inhabitants of Vṛndāvana. This personal form (svayam-rūpa) can be further divided into the prābhava and vaibhava forms. 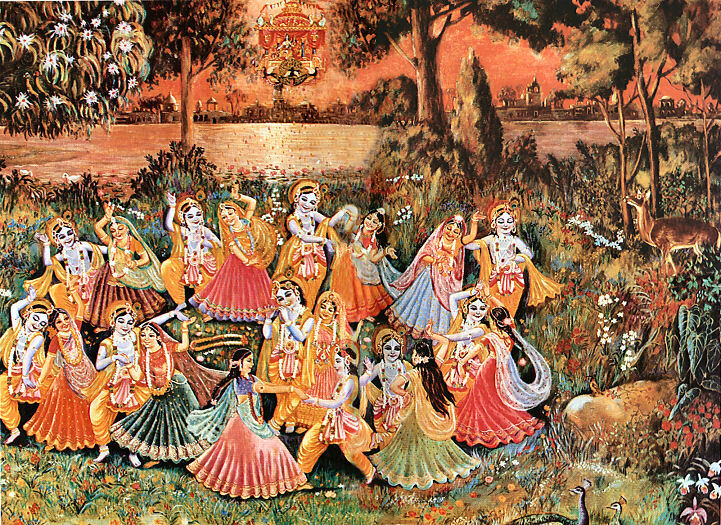 For instance, Kṛṣṇa expanded Himself in multiple forms during the rāsa dance in order to dance with each and every gopī who took part in forms in order to accommodate His 16,108 wives. Today we honor the disappearance day of Srila Rupa Goswami. 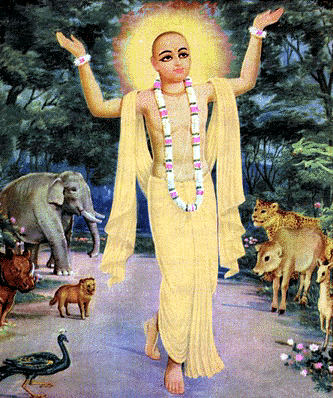 Śrīla Rūpa Gosvāmī, the younger brother of Sanātana Gosvāmī, went to Prayāga, the modern city of Allahabad, with his younger brother Vallabha. When the two brothers heard that Lord Śrī Caitanya Mahāprabhu was staying there, they both became very happy and went to see the Lord. At that time the Lord was on His way to visit the temple Bindumādhava. On the way to the temple, the Lord was chanting and dancing, and thousands of people were following Him. Some of these people were crying, and some were laughing. Some were dancing, and some were singing, and some were falling on the ground, offering obeisances to the Lord. In all cases, all of them were roaring the holy name of Kṛṣṇa. 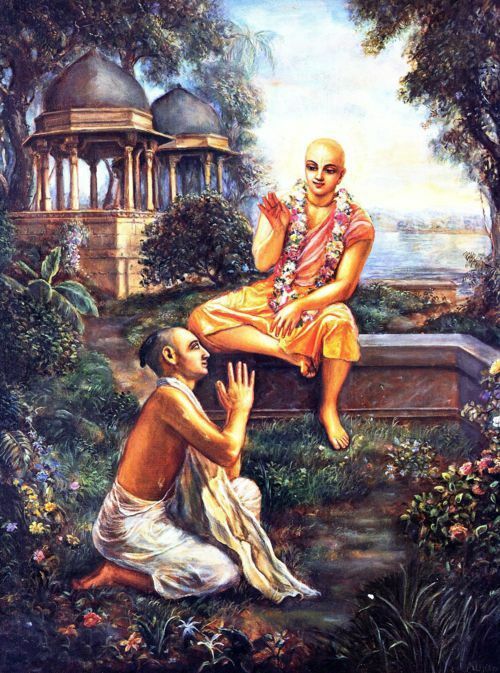 It is said that in spite of being at the confluence of the rivers Ganges and Yamunā, Prayāga was never flooded until the appearance of Caitanya Mahāprabhu, at which time the city was overflooded by love of Kṛṣṇa. The holy name of the Lord—Hare Kṛṣṇa, Hare Kṛṣṇa, Kṛṣṇa Kṛṣṇa, Hare Hare/ Hare Rāma, Hare Rāma, Rāma Rāma, Hare Hare—is a transcendental vibration because it comes from the transcendental platform, the supreme abode of Kṛṣṇa. Because there is no difference between Kṛṣṇa and His name, the holy name of Kṛṣṇa is as pure, perfect and liberated as Kṛṣṇa Himself. …In this age of logic, argument and disagreement, the chanting of Hare Kṛṣṇa is the only means for self-realization. Because this transcendental vibration alone can deliver the conditioned soul, it is considered to be the essence of the Vedānta-sūtra. According to the material conception, there is duality between the name, form, quality, emotions and activities of a person and the person himself, but as far as the transcendental vibration is concerned, there is no such limitation, for it descends from the spiritual world. In the spiritual world there is no difference between the name of the person and the quality of the person. Of course in the material world there is a difference. Because the Māyāvādī philosophers cannot understand this, they cannot utter the transcendental vibration. 1968 Edition of "Teachings of Lord Chaitanya"
The following is a letter sent to me earlier today by Pralada-Nrsimha Prabhu, informing me and our readers that the Originial 1968 Edition of “Teachings of Lord Chaitanya” are now available for the first time ever online, as they have been digitized. They are available for free, thanks to a lot of hard work by Ahaituki Bhakti dd who simply asks for your well wishes and blessings in return. 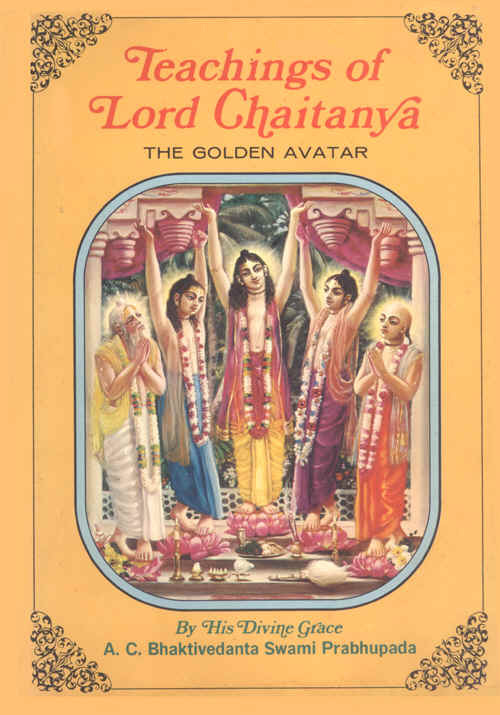 This original authorized edition of The Teachings Of Lord Caitanya is being presented free for everyones benefit. I am happy to offer (attached below) a digitized (FREE) file of the original 1968 TLC! As far as I know this is the first time it has been available in any digitized format to any one, ever!